Before placing any money with a financial advisor, it is important to know what they offer beyond the S&P 500, Dow Jones Industrial Average, or NASDAQ. 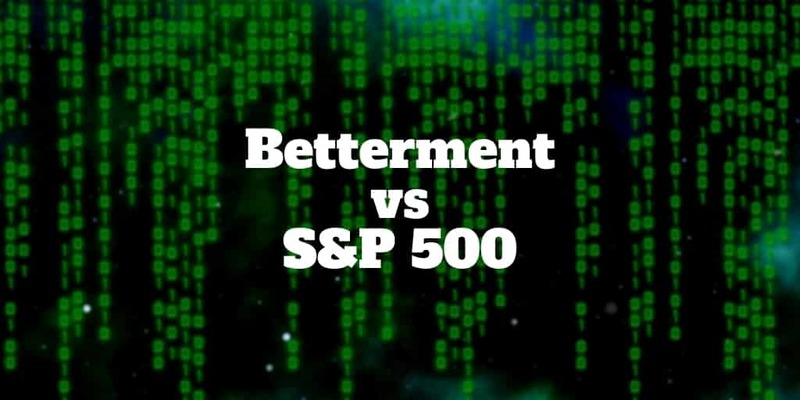 If you’re looking to compare the S&P 500 vs Betterment, a leader in the robo-advisor industry, a big question is do Betterment returns beat total stock market returns? In this review we’ll use VTI to represent the stock market and compare it to Betterment so you can make the best choice. What makes investing tricky from time to time is that different types of stocks perform better at different times. Sometimes large-cap stocks outperform and other times small cap stocks do best. Investors who look in the rear-view mirror and chase stocks that have had good runs often buy too late and then sell for losses. Where the the Vanguard Total Index Market Fund [VTI] shines is that it doesn’t cherry-pick one class of stocks over another. The entire gamut of stocks falls under its umbrella, including large-cap, mid-cap, and small-cap stocks. It also wins high marks for charging among the lowest fees in the industry. The Vanguard Total Index Market Fund expense ratio is just 0.04%. To highlight how low that is, most similar funds charge 0.95%. If you were to build a similar portfolio in a standard brokerage account at TD Ameritrade or tastyworks you’d probably pay more in commissions than Vanguard charges for the same exposure. And you’d be stuck with the responsibility of selling positions that are removed from the S&P 500 or other indexes and buying new positions. Quickly, you can imagine how it would swallow up your money and time. Much simpler instead to stick with Vanguard’s VTI fund that mimics the returns of the CRSP US Total Market Index. Not only are different size companies included but also both value and growth stocks are included too so you can be confident that it is a diversified basket of stocks. The portfolio mix Betterment uses is spread across up to 12 asset classes. Client portfolios are highly diversified because Betterment aims to maximize returns for each level of risk by applying Nobel-prize winning Modern Portfolio Theory. All Betterment portfolios are rebalanced regularly to ensure they remain diversified but how do S&P 500 returns or, better yet, total stock market returns compare? Betterment performance returns vary by client because each one has a different risk profile and financial goals leading to different allocations. On average, Betterment claims returns can be increased by 2.66% using various tax strategies mentioned below according to the robo-advisor. The total stock market performance returns in recent years are listed below using the Vanguard Total Index Market Fund as the benchmark. Focusing on performance returns alone can be a red herring because returns net of taxes is what you actually put in your pocket. So let’s see when considering tax implications, who wins the race: Betterment or the Vanguard Total Index Market Fund? Tax-loss harvesting is an automated service that monitors client portfolios daily to check whether tax savings are possible. Losers are sold and counted against winners to lower capital gains taxes. The sold positions are then replaced with new, similar holdings to keep the portfolio diversified. Daily tax-loss harvesting only applies to taxable accounts. To optimize for tax implications across both taxable and retirement accounts, Betterment tax coordinated portfolios are used. The portfolios are built so that tax inefficient assets are placed in tax-advantaged accounts and tax efficient funds are placed in taxable accounts. Vanguard Total Index Market Fund buyers are taxed only when selling shares for a gain. The timing of sales is important. When you sell for a gain within a year of purchasing VTI, you pay taxes at ordinary income rates. By holding longer than a year, you enjoy the current capital gains tax rate. Management fees and investment expenses are the two costs clients pay. The basic service, Betterment Digital, costs 0.25% of managed assets yearly. Betterment Premium, which includes unlimited access to financial consultants, costs 0.40% annually. Investment expenses are the fees charged by the funds placed in your portfolio and average 0.13%. The investment expenses charged by VTI are the lowest of any similar fund, just 0.04%. On cost, VIT cannot be beaten. However Betterment might have an edge on returns net of taxes if its claims are correct that performance can increase by as much as 2.66% on average using advanced tax strategies. Betterment Digital has no investment minimum but Betterment Premiums requires clients to invest $100,000 to qualify for an account opening. The Vanguard Total Index Market Fund has no minimum investment amount. Individual, joint, retirement and trust accounts are all available. The Vanguard Total Index Market Fund can be purchased in almost all account types too. >> Need help with your 401(k), check out blooom? Betterment and the Vanguard Total Index Market Fund are both weighted towards stocks over bonds. ✅ Low Fees: It’s near impossible to beat an investment expense of just 0.04% – Vanguard’s total stock market fund wins on fees. ✅ Returns: If Betterment can deliver on its claims to increase after-tax returns, it may ultimately beat VTI. ✅ Investment Minimum: You don’t need to meet any threshold to invest in Vanguard’s VTI fund. ✅ Tax Strategy: Tax-loss harvesting and tax coordinated portfolio strategies give Betterment the clear victory on tax implications. ✅ Dividends: Investors looking for passive income stream are paid quarterly. ✅ Hands-Off Investors: Betterment is ideal for investors who want to give control to a financial advisor. ✅ Active Investors: Want more control over your portfolio holdings and composition? Vanguard is best. ✅ Account Types: A wide variety of accounts are available from taxable to retirement and even trust accounts. Investors who care about all-important after-tax returns and want to hand over investment control to a financial advisor will find Betterment an ideal match. While Vanguard offers many enticements, including low investment expenses and no minimums, it requires investors to take a more active role in managing their portfolios. Clients need to decide how much to buy, when to buy and when to sell. Betterment allows investors to be hands-off. It’s also got a lot of bells and whistles, like socially responsible portfolios, automated charitable giving, an advanced retirement calculators, and behavioral finance methods to influence goal-setting.